Guest blogger Jessie Donavan on her unexpectedly tough journey from Los Cabos to South Africa. 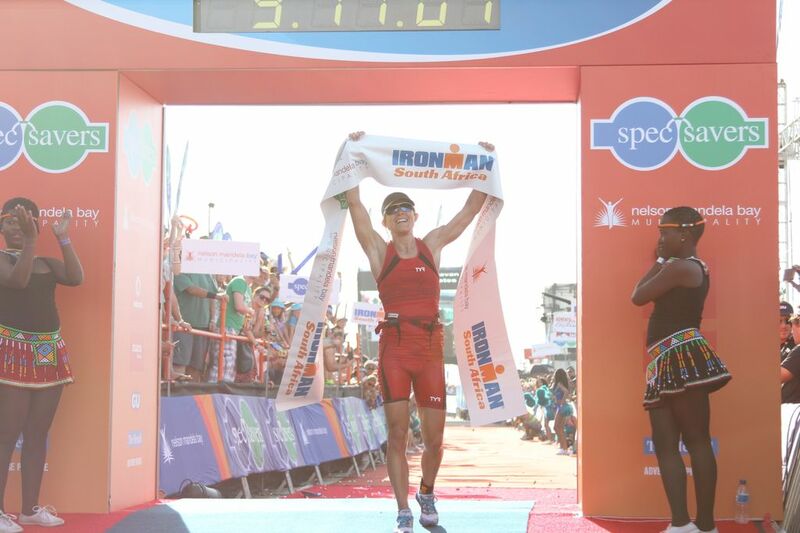 Jessie Donavan won IRONMAN Lake Placid and IRONMAN Mont Tremblant last year and just won IRONMAN South Africa last month. Each month she’ll be sharing a “day in the life” post as she aims for a Kona start. Today, she remembers a major setback prior to last weekend’s South Africa win. IRONMAN Los Cabos was my first DNF, or “did not finish,” ever. In all of my years of racing, whatever the sport, the thought of not finishing a race has never crossed my mind. Ten years ago I ran myself into complete kidney failure during the Boston Marathon. I finished that race not being able to bend my legs, unable to hear and vomiting uncontrollably, but didn’t have one moment where I thought about stopping. Becoming a professional triathlete over the past year has changed things. Last season was my rookie pro year and I went into it with very little expectations. I did five IRONMAN races and each one tested me as an athlete and helped me grow. This year I have new goals for myself, an amazing group of sponsors who support me and a family behind me. Just 15 miles into the bike leg in Cabos, I ended up with a shredded tire and had to wait almost 50 minutes for mechanical support. After getting back on my bike and looking down at my watch, I knew that none of my goals for this season were going to be accomplished in that race. The old me would have jumped back on the bike, put my head down and finished fighting; the new me stayed focused and thought about what I could still get out of the day. It was clear that using up one of the IRONMANs I have in me just didn’t make sense. It was also clear that stopping and giving up was not the best choice. I decided to finish the bike leg and carry out my pacing and nutrition strategy exactly as planned. There were times I wanted to put my head in my aero bars and cry, but I didn’t. My power file from Cabos showed a consistent effort both before and after the stop at exactly the output that was planned. I learned a lot from that day and I was able to practice staying focused when a curve ball came my way. I then ran the first eight miles of the run at the heart rate and pace I’d planned for, doing what was best for my season. -Breakfast: two cups of unsweetened applesauce, one scoop of protein power, a banana, one bottle of PowerBar Perform. -20 minutes before the start: one caffeinated gel. -On bike: 10 to 12 bottles of PowerBar Perform. (The on course drink being passed out at Cabos was Gatorade, so I started with two bottles of Perform and then switched to Gatorade.) Six caffeinated PowerBar Chocolate Gels, two non-caffeinated PowerBar Vanilla Gels. -On run: four caffeinated PowerBar Chocolate Gels, Perform at every aid station, cola in the last 10 miles only if needed. I jumped headfirst into training the day after I arrived home from Los Cabos, which was no easy task. In my mind I was supposed to be recovering from an IRONMAN, have some time on my hands and catch up on life. Instead I was right back at it, full time. That first week back, everything felt hard. I thought I would never feel fast again, I was behind on sleep and I needed to reorganize my race schedule. My very wise coach told me to just turn my brain off, do the work, rest and not worry about paces. He knew I would come around and, sure enough, one week later I was back, excited to race once again. We put together a new race plan for the season with the same goals in mind that we had back in January. This new plan has me racing IRONMANs quite often this season—exciting for me because I love the distance. This was a tough month for Jessie. Going into IRONMAN Los Cabos, Jessie was in the best shape of her life, confident and very rested. We had just come off of a very heavy block of training. The mental load on an athlete after traveling across the world to race and experiencing what Jessie did in Cabos is tough. But for an athlete hoping to qualify for Kona this year, we had no choice but to get up and train again for another IRONMAN: in this case, IRONMAN South Africa this past weekend. After a couple of very tough weeks following Cabos, everything began to click and Jessie was back in better shape than ever. As most of you know, it all worked out for the best as Jessie won that race, rendering all the struggle and sacrifice well worth it.